How to Maintain Control of Your Estate and Provide Peace of Mind for a Second Spouse | The Levin Law Firm - Philip Levin, Esq. Estate planning for couples in a second or later marriage can be challenging, particularly when one spouse has significantly more assets than the other spouse. 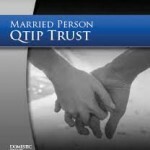 One solution for allowing the well-to-do spouse to maintain control of his or her assets, and provide peace of mind for the other spouse, is to establish a “Lifetime QTIP Trust.” In this edition of Estate Planning Matters, we will detail how a “Lifetime QTIP Trust” can provide multiple benefits to married clients with lopsided estates, and how you might alter a client’s investment strategy when using it. In the estate planning world a “QTIP Trust” has nothing to do with those handy cotton swabs used for cleaning ears, applying cosmetics, or making children’s crafts. Instead, QTIP is a “Qualified Terminable Interest Property Trust,” which is the legal name for a type of Trust that allows a wealthier spouse to transfer assets into Trust, rather than outright, for the benefit of a less wealthy spouse, completely free from both estate and gift taxes. Many married couples have estate plans that make use of a QTIP Trust, which takes effect after the death of the first spouse using the so-called “A – B Trust” strategy. After the first spouse dies, the “B Trust” holds an amount equal to the federal estate tax exemption amount, (currently $5.43 million in 2015) and the “A Trust” holds the excess assets which distribute upon the passing of the first spouse. Under this strategy the “A Trust” is in fact a “QTIP Trust” which qualifies for the unlimited marital deduction, meaning that property passing into the Trust will not be subject to federal estate taxes until the surviving spouse dies. Here is an example: Fred and Susan have both been previously married. Fred has two children from his prior marriage and Susan has three, and their estates are disproportionate – Fred is worth $2 million and Sue is worth $10 million. With the A – B Trust strategy, if Susan dies first the B Trust is funded with $5.43 million and the A Trust is funded with $4.57 million. No estate tax will be due at Susan’s death since the B Trust utilizes her federal estate tax exemption and the A Trust qualifies for the unlimited marital deduction. In addition, when Fred later dies, the A and B Trusts can be drafted so that what is left passes exclusively to Susan’s three children (or whomever else she chooses). What if instead of creating and funding the QTIP Trust after Susan dies, she creates and funds the QTIP Trust for Fred’s benefit with tax free gifts while she is still alive? This is the “Lifetime QTIP Trust”, which can be designed by competent estate counsel to be very flexible and works extremely well in a variety of situations. Outright gifts to a spouse during life or after death lead to total loss of control. For married couples with lopsided estates and clients with children from prior marriages, the problem is exacerbated by the difference in wealth – while the well-to-do spouse will be just fine if the less wealthy spouse dies first, the opposite is not true. The wealthier spouse can create and fund a Lifetime QTIP Trust, without using any gift tax exemption. Provide an excellent opportunity to make use of the less well-to-do spouse’s generation-skipping tax exemption, which is not portable under current law. During the beneficiary spouse’s lifetime, he or she will receive all of the Trust income and may be entitled to receive Trust principal for specific purposes. When the beneficiary spouse dies, assets remaining in the Lifetime QTIP Trust will be included in the surviving spouse’s estate, thereby making use of the less wealthy spouse’s otherwise unused federal estate tax exemption. If the beneficiary spouse dies first, the remaining Trust property can continue in an Asset Protection Trust, for the grantor spouse’s benefit and the remaining assets at the grantor’s passing will be excluded from the grantor spouse’s estate when he or she dies. Planning Tip: As with other types of estate planning strategies, a Lifetime QTIP Trust is not a “one size fits all” and must be specifically designed to each client’s unique family dynamics and financial situation. In addition, only an attorney experienced in implementing advanced estate planning techniques should be drafting Lifetime QTIP Trusts for your clients. 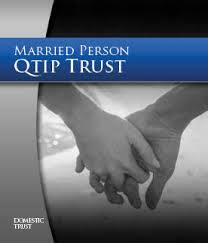 The estate planning strategy utilizing a Lifetime QTIP Trust differs from the conventional “A Trust” because the surviving spouse has access to the Lifetime QTIP Trust’s investment income but not necessarily the principal (for example, the lifetime QTIP might permit distributions of principal to the surviving spouse for health, education, maintenance, and support purposes). So while a particular client’s own goals, risk tolerance, time horizon, and income tax bracket must be taken into account, all else being equal, the investment strategy for a Lifetime QTIP Trust would usually focus more on generating income to offset the limited access to principal, assuming income is needed at the time. This might mean that recommendations to your client among publicly traded securities would skew more toward high-dividend stocks, high yield corporate and muni bonds, mortgage real estate investment trusts (REITs), business development corporations (BDCs), and certain master limited partnerships (MLPs), as well as high-income exchange-traded funds (ETFs), closed-end funds (CEFs), and mutual funds. In the non-traded arena, you might consider REITs, BDCs, or certain life settlement debt instruments. Or, if your client is an accredited investor, you might consider high quality private debt or equity, provided the income warranted the risk. For advisors who tend toward annuities for their planning strategy, because assets in annuities would forfeit the Lifetime QTIP Trust’s step-up in basis at the second death, a better place to utilize them might be the “B Trust” (bypass trust), where there is no such second-death step-up upon the passing of the surviving spouse. That being said, if your client thought the lost opportunity to use the Lifetime QTIP Trust’s step-up in basis was less important, you might consider an annuity with a reasonably high guaranteed income, coupled with an enhanced death benefit to replace the typical depletion of capital stemming from a combination of annuity fees and distributions. Finally, life insurance is often used in conjunction with establishing a Lifetime QTIP Trust. More specifically, due to the Lifetime QTIP Trust’s focus on income, all else being equal, this strategy possibly will impair the capital that would eventually be distributed to the remainder beneficiaries, at least when compared to what they might have received had the holdings been structured less for income and more for capital gains and capital preservation. Thus, financial and insurance advisors might wish to evaluate utilizing a survivorship life insurance policy to provide an infusion of cash to the remainder beneficiaries upon the passing of both spouses, which policy can be owned from inception by an irrevocable life insurance trust (ILIT). If you have clients in a second or later marriage with uneven assets, please call The Levin Law Firm to discuss the use of a Lifetime QTIP Trust, along with other vitally important estate planning techniques. We can help your clients determine which strategies will work best for their families. And, if you have any questions about trust and estate planning matters, we would be happy to answer your questions. Feel free to email us your questions at: info@levinlawyer.com. We look forward to helping you better serve and support your relationship with clients and their adult children. To discuss a particular client situation or arrange a consultation with attorney Philip Levin, Esquire, please call The Levin Law Firm at (610) 977-2443.